These pages were created as mats for playdough or loose parts play, to be used in my kindergarten classroom. I suggest laminating these pages before using them. 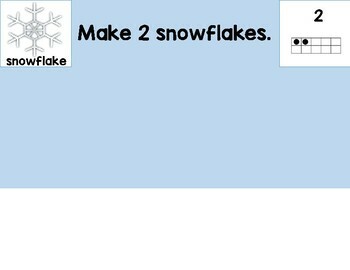 1: Snowflake mats for the numbers 1-10. 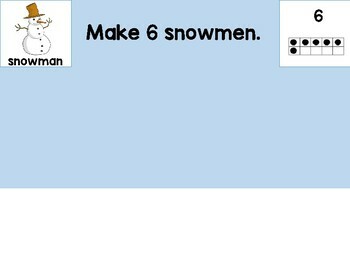 2: Snowman mats for the numbers 1-10. 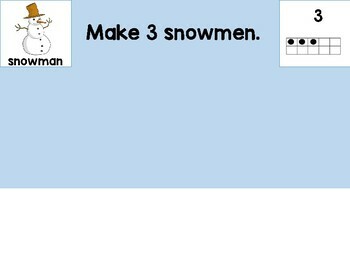 3: Snowflake mats for the numbers 1-10 with dots as a helpful hint to show the students how many to make. 4: Snowflake mats for the numbers 1-10 with basic snowmen outlines as a helpful hint to show the students how many to make. Please see the preview file to preview all of the mats before you purchase them. The preview images are smaller but the actual mats are full 8.5x11 size.